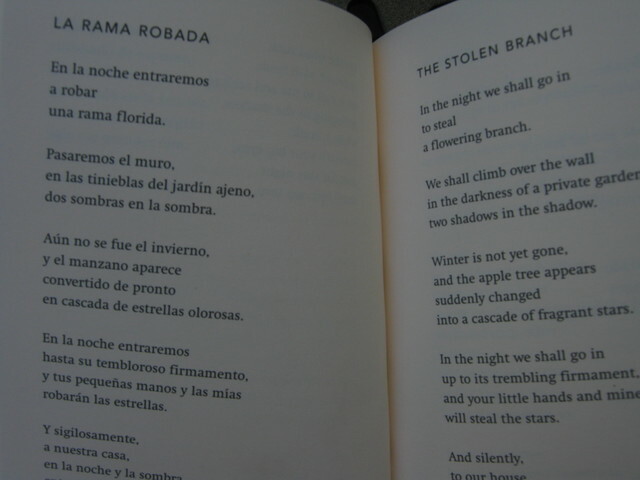 Excerpt of Pablo Neruda’s poem translated into English. On December 11th, Quebec’s authors’ union, the UNEQ, in collaboration with Montreal’s Goethe Institute and Quebec’s State of Bavaria Office, presented a roundtable discussion on translation and its subtleties in poetry. The event, hosted by Manfred Stoffl, director of Montreal’s Goethe Institute, united two professionals: Gilles Cyr, a Montreal-based poet and translator, and Michael von Killisch-Horn, a literary German translator. During the hour-and-a-half roundtable discussion, we had the opportunity to listen to a series of poems first read in French, followed by presentations of the same poems in German. The first set of poetry excerpts we heard dated back to the 1990s. As the discussion progressed, we heard more recent excerpts. And as the presentation continued, the excerpts became longer. But the discussion wasn’t focused only on presenting poems in French and German. The presentations were occasionally interspersed with question and answer periods. The first question that Stoffl asked his guests was how they felt about hearing their own poems read and translated. According to Cyr, poems need to be translated to make them accessible to other target language readers. In addition, Cyr mentioned that small-scale countries often translate their own works by need of cultural and international recognition, as well as an understanding of how other readers and poets perceive poets from their homeland. During the first round of discussion, we learned that Cyr and Killisch-Horn share one common difficulty: they have no knowledge of particular foreign languages. Cyr has no command of Korean; Killisch-Horn has no command of Hebrew. Both professionals have had to work with these respective languages during their careers. How do translators work with languages they do not master? When translating literary and dramatic works, translators collaborate with authors—or another party. Often, the other parties have a command of the source language(s) in question. In such a situation, translators simply edit the translations to ensure they comply with the source texts. If certain errors creep up, the target texts in question are corrected before moving to the next batches. This, according to Cyr, is a normal procedure among translators, poets, authors, and playwrights. For the record, Cyr works with others to translate literary works from Armenian to French; he translates from Italian and English into French himself. Killisch-Horn, on the other hand, translates from French, Portuguese, Spanish, and Italian into German. Furthermore, we learned that Killisch-Horn translates more than poems: he also works with novels, films, and television series. What are the greatest translation challenges for Killisch-Horn and Cyr? For Killisch-Horn, the challenge lies in respecting the authors’ texts and writing style. It is also challenging to reproduce a literary or poetic text in the target language, for the translator must understand the cultural differences among the various target language readers. For Cyr, the challenge lies in working with other languages; translators need to grapple with various sentence structures in source texts. For instance, many stories in Western cultures begin with the opening sentence “Once upon a time…” In languages like Korean, however, such a structure does not exist; instead, stories begin as such: “When tigers smoked cigars…” At first glance, the difference in writing between the Western and Eastern cultures is striking. But Cyr reminds us that starting sentences like those in Korean isn’t a foreign concept—French used to begin stories the same way. Additionally, we learn that Korean poets write freestyle poetry; in French, poems are written with a specific style in mind. Another challenge lies in grammar: Korean, for example, does not distinguish between singular and plural nouns. How do literary translators make a living for themselves? Killisch-Horn told us that it is not easy to make the ends meet, for translators like him are often underpaid. To avoid this difficulty, Killisch-Horn reminded us that it is important to accept each project that is proposed to us, especially if translators don’t have other jobs or projects that provide an extra income. After reading another series of poems and translations, Stoffl opened the floor to the audience. I was curious to know how Cyr ensured translations were faithful to source languages when he hadn’t any active knowledge of the source language(s) in question. I also wanted to know if it was possible to translate any text when a translator has active or passive notions of a language. To answer these questions, Cyr informed other audience members and me that Korea has a proactive cultural policy in place, making it possible for editors to ensure that target texts are true to source texts. Unlike many translators, Cyr reads the translations as soon as he receives them and ensures they comply with French grammar and style. (He doesn’t read the source text several times before translating.) When it comes to notions, it is important to have some knowledge of the themes, traditions, or styles unique to the source culture and language. It was a pleasure to attend this roundtable discussion! I liked discovering how Cyr and Killisch-Horn deal with the many difficulties and challenges they face in their career. And, of course, I enjoyed listening to wonderful poetry.